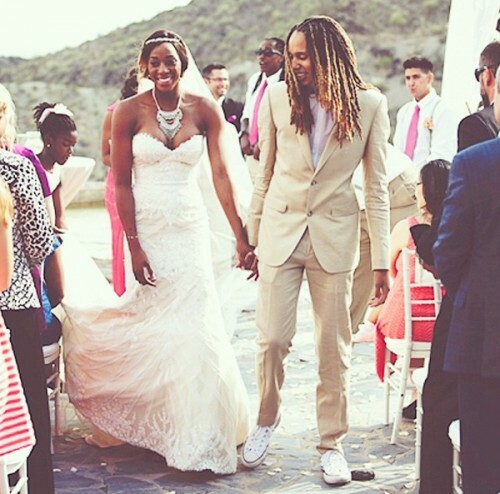 Glory Johnson (left) and Brittney Griner wed in Phoenix on May 8, 2015. 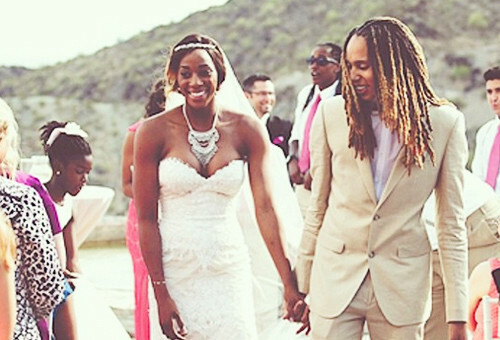 PHOENIX — WNBA stars Brittney Griner and Glory Johnson were married Friday at a resort in Phoenix, reports E! News. Johnston, who posted a wedding photo on Instagram Saturday, wore a strapless champagne wedding gown while Griner sported a tan suit and white tennis shoes. On April 28, Griner accepted a plea deal to enter domestic violence counseling, after which the charges against her will be dismissed, reports USA Today. Johnson enrolled in counseling voluntarily. Griner plays center for the three-time WNBA champion Phoenix Mercury; Johnson is a forward with the Tulsa Shock. The couple were engaged last August.